Your spOre bell is ringing. No, you're not infected with mold, but you do have great taste. The spOre Bell from spOre [products] is a doorbell that's so cool, the first time I saw a wall of them on display I thought they (it?) were interactive art. Which, in a way, I guess they are. They look intriguing, and if you touch them, they react in interesting ways. Plus, they light up. And they squish. Ick! Cool! 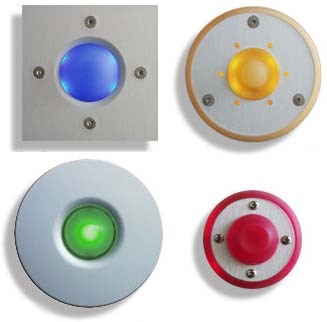 According to spOre, spOre bells are made with "a soft to the touch polymer resin button and anodized aluminum." Lighting comes from an LED. A spOre bell will set you back $29 - $89. spOre also carries door numbers in both plane and hole formats, plus something called "Hole Numbers With Doorbell", a light switch, and a doorbell ringer. Oddly, the ringer is old school in design. Some of the products are listed on spOre's Web site but don't include photos.